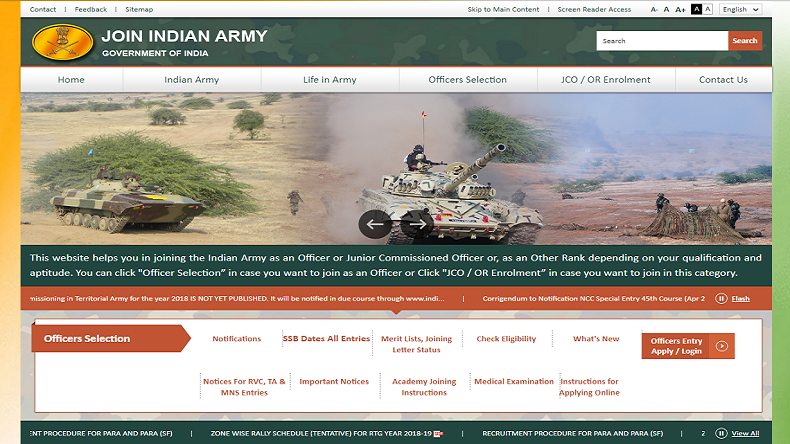 The Army Recruiting Office in Coimbatore has invited applications for various posts on its official website. Candidates can follow the steps given here and check the details of recruitment here. Army Recruitment 2018: Applications have been invited from eligible candidates by Army Recruiting Office, Coimbatore for the Army Recruitment Rally which has been scheduled to be conducted at Salem from 22 August 2018 to 02 September 2018 at Mahatma Gandhi Stadium. According to reports, there are vacant positions for the posts of Soldier Technical, Soldier Technical (Avn & Amn Examiner), Soldier General Duty, Soldier Nursing, Assistant, Soldier Tradesman and Soldier Clerk/Store Keeper Technical. The last date for submission of online applications on the prescribed format is August 6, 2018 and candidates who are interested to apply should note that no late applications will be entertained by the recruitment authority after the last date. The official notification on the website also indicates that admit cards will be available only after August 10, 2018. The candidates can check the eligibility criteria and other necessary details of the recruitment process on the official website. The candidates should also note that application will be accepted online only.